Built to cross ultra-difficult off-road terrain, just 694 2cv Safaris were built, target buyers being the French military, police, and oil companies, all of whom needed the extra mobility provided by the Safari version. What’s different about the OttOmobile model? 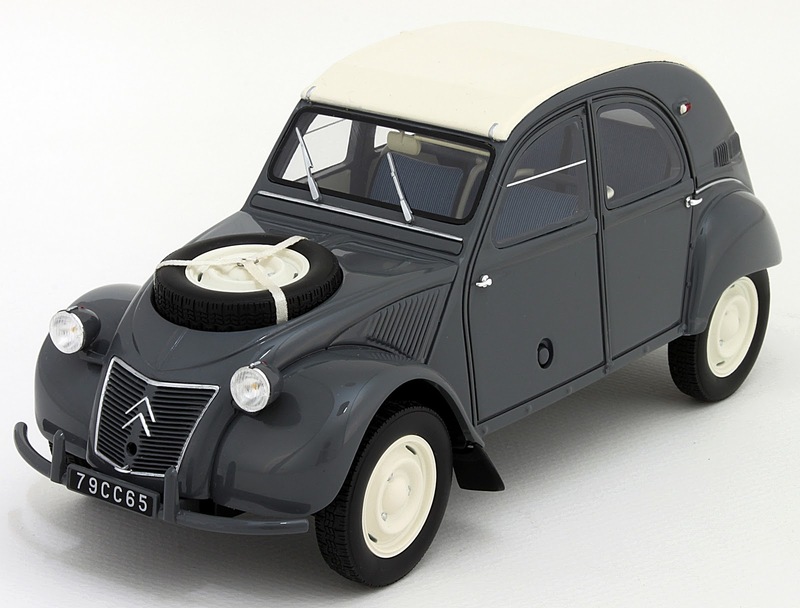 OttO has modelled the unusual nature of the 2cv Safari well, with the spare wheel now carried over the front engine bay, in a specially-pressed metal dish. 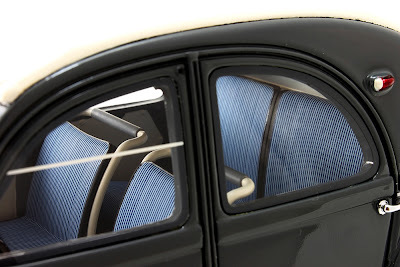 At the back, storage behind the rear seats was taken up by the second engine, though the unobservant could be forgiven for not realising it - all you can see is an intake grille. 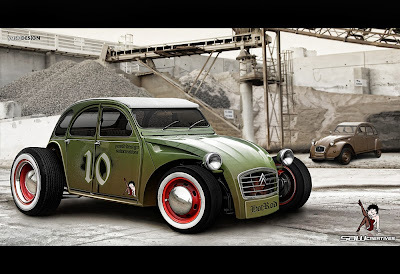 Still, it’s neatly presented in OttO’s version, as is the characteristic ‘sit’ of the car, with raised suspension for off roading with front and rear drive systems in place. 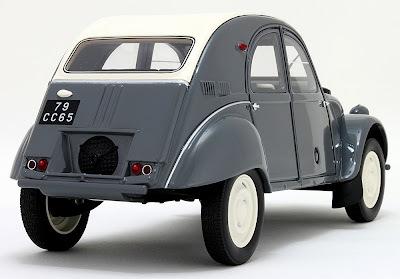 In fact, one of the design drivers for the original 1948 2cv was to be able to cross a ploughed field carrying a crate of - unbroken - eggs, so it shouldn’t have been too much of a problem for Citroen engineers to add more of the same mountain goat ability with the limited-edition 2cv Safari. OttO has presented the rest of the Citroen 2cv Safari neatly enough, as you can see from the pictures. At this scale though, it might be nice to see working windows, especially as the real thing had simple opening flaps in the front, rather than winders. The Citroen 2cv Safari is planned for April release, and as ever with OttO productions, it’s wise to place an order as soon as possible, as the company’s productions are often sellouts. 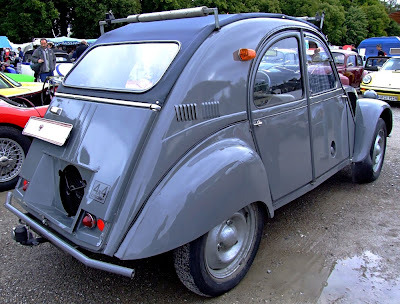 The real thing, Citroen 2cv Safari seen at a classic car meeting. What about a 2cv kit? 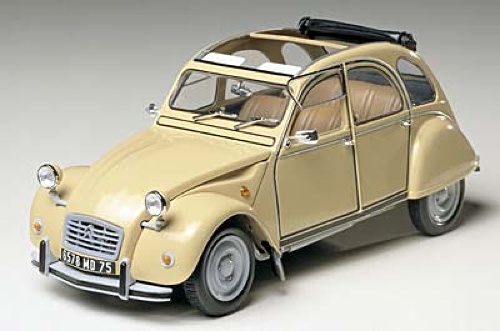 Apart from the Safari version, which is unique to OttOmobile, there are plenty of 2cv kits around, one of the best being from Japan, in the form of the 1:24 scale Tamiya kit (above). It’s a typically thorough Tamiya production, with body and interior in white plastic, engine components in dark grey, detailed floorpan in black. Bright parts such as mirrors and lamps are chrome-plated, and decals include a choice of European or Japanese number plates. 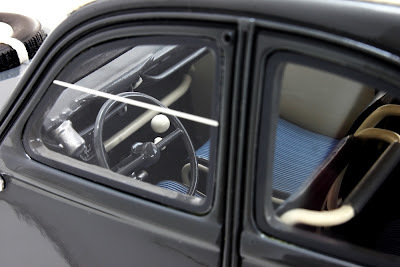 Tamiya have also included in the smaller scale an item missing from the OttO model - the bottom half of the driver’s window flips up to the open position. 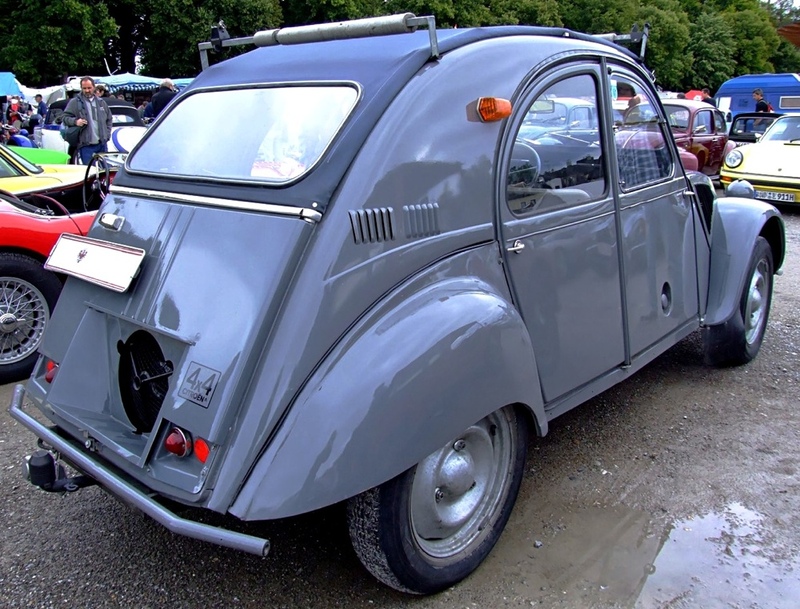 The bizarre styling of the 2cv is one of this writer’s favourite automotive oddities, so it’s good to see its lines followed faithfully in the model. Items like the leading and trailing arm suspension are moulded accurately and, like the real thing, you can have the top open or closed, with convincingly textured canvas-look roof components supplied for either choice. 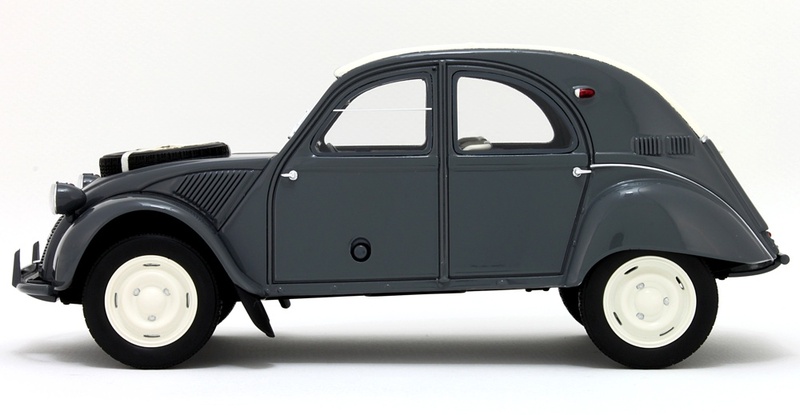 When assembled, the Tamiya Citroen 2cv Safari measures 156 mm (6.1 in) long. Here are two thoughts for something different in the world of French ugly ducklings. The hot rod (above) comes from Yasi Design and ought to be an easy mod if you like that sort of thing (here's a thumbs-up from the SMN Crew), while the sketch (below) is an official concept for what may be a retro-look car of the nearish future. It’s called the Revolte, which is - somewhat unsurprisingly in these green-tinged times - conceived as an eco-electric vehicle. 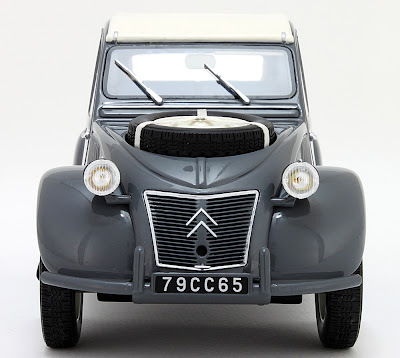 Sorta cute, in an ugly way, and clearly stays with the spirit of the original 2cv. Pic of Citroen Safari courtesy ‘ChiemseeMan’. OttO stuff also available here. 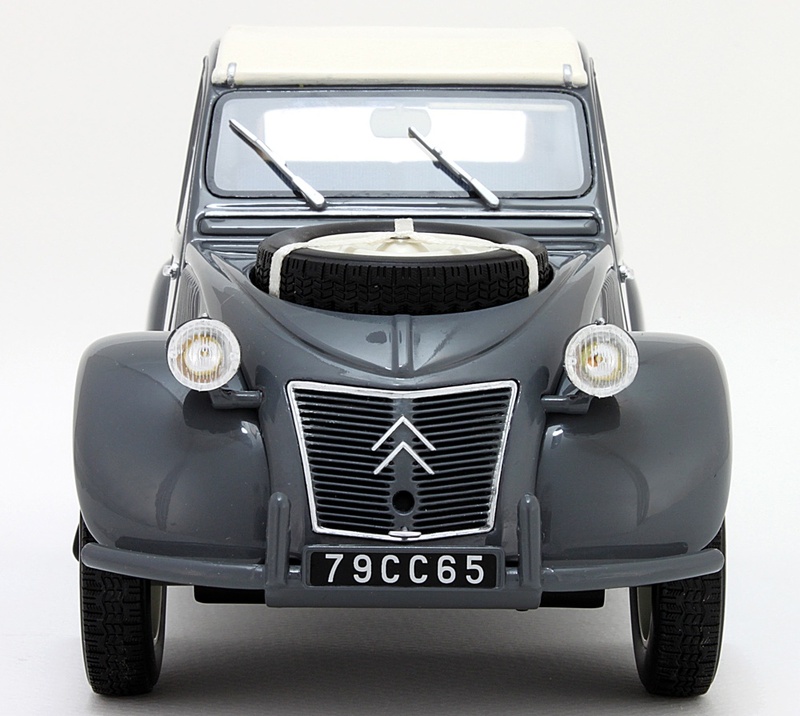 A host of Citroen 2cv models here, including the Tamiya 1:24 scale version. Take your pick! 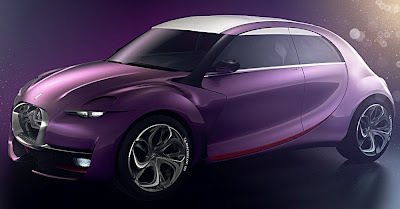 Visit the Citroen Revolte here. 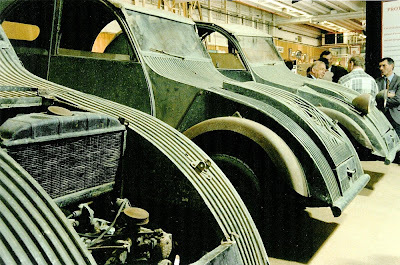 Bonus pic - here's are three early 2cv models of the late 1940s. The tin-can looks make later versions, especially the swoopily-painted Charleston editions, look positively stylish!